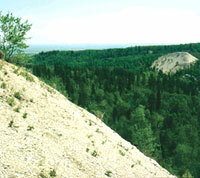 Establishment of protected areas is public policy in Manitoba, and takes place through the Protected Areas Initiative. This process is science-based and involves consent from affected First Nations; industry sectors; and input from the public. Protected areas are supported by and benefit Manitobans. Potential protected areas are designed by Manitoba Conservation in order to represent key ecological features in each natural regionÍs landscape. Selected areas are mapped and become known as Areas of Special Interests (ASIs). ASIs can also result from a nomination by a First Nation, community or industry sector. Government branches with an interest in the area, such as the Forestry Branch or Manitoba Geological Survey, review for potential land use conflicts. Communities in the vicinity of the ASI review and comment also. In the case of First Nations, consent from the community. Industry Sectors also review ASIs. The Mining Sector has a formal process for review and ranking of ASIs. Forestry companies, and producer groups affected by ASIs also conduct technical review. At all stages, ASIs are assessed to determine whether their protection adequately represents enduring features on the landscape in the Natural Region where the ASI is located. As certain stages in the process, specific affected Manitoba communities are provided with information about the potential protected area and given opportunity to comment. Based on technical review and comments from all parties, the ASI may be re-designed. A decision is made as to the next steps. Park Reserves, and other protected areas designations are mapped by the Department of Surveys and Manitoba Conservation, throughout these stages. During interim protection, technical reviews and consultations, with affected communities, are undertaken to confirm protected status. Technical review to confirm a protected areaÍs contribution to representation of enduring features in the Natural Region also takes place. Final designation of a protected area is through a Government of Manitoba regulation, under various Acts. If designation is under the Parks Act, lands within the park may be zoned under different land use categories (LUC) that allow or prohibit certain activities. Only LUCs that prohibit forestry, mining, hydroelectric development, roads, and other activities disturbing to habitat are protected areas. Protected areas permit activities such as hunting, trapping or fishing and respect Aboriginal and Treaty Rights. Crown mineral rights are withdrawn from protected areas. A management plan for a protected area is developed in consultation with affected communities, and reviewed under the Parks Act. Once formally designated, the Government of Manitoba makes an announcement of the creation of the new protected area. Usually, a press release is issued, and the Government may choose to have a ceremony that acknowledges the communities who supported protection of the area.